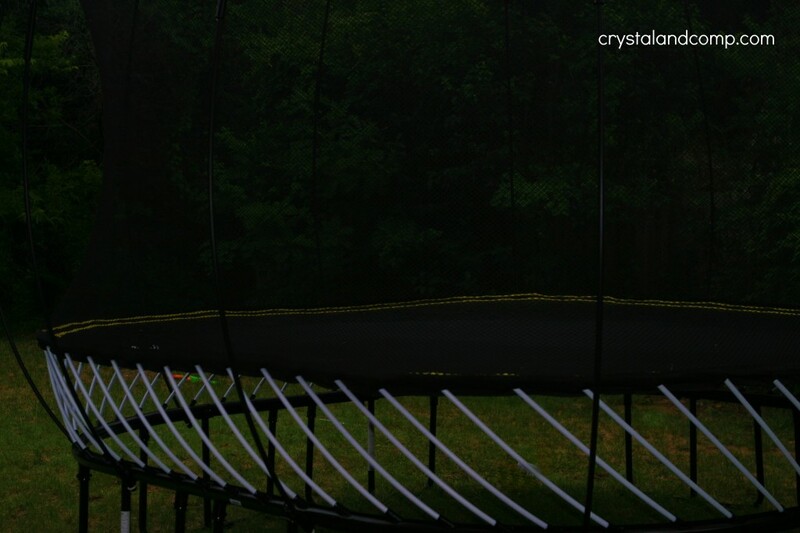 Do you believe there is a safe trampoline on the market? Do you think it is possible? 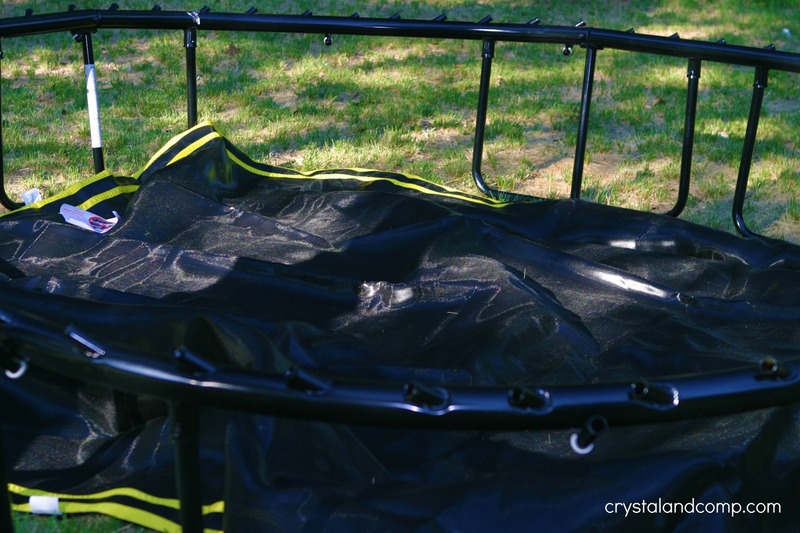 A few weeks ago when I first shared the giveaway with you for the free large Springfree Trampoline many of the readers who entered the contest were excited to see there is now a safe trampoline on the market. 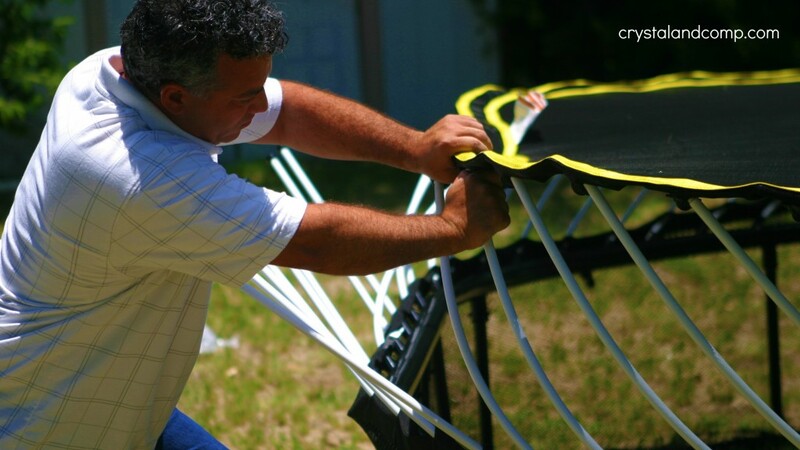 Many of you share the same ideas and concerns when it comes to trampolines. You voiced that traditional trampolines are dangerous and many of you have reservations about having one for your home even though your children have begged. You share the same view with my husband. Until now, the trampoline had never changed since the 1930’s. 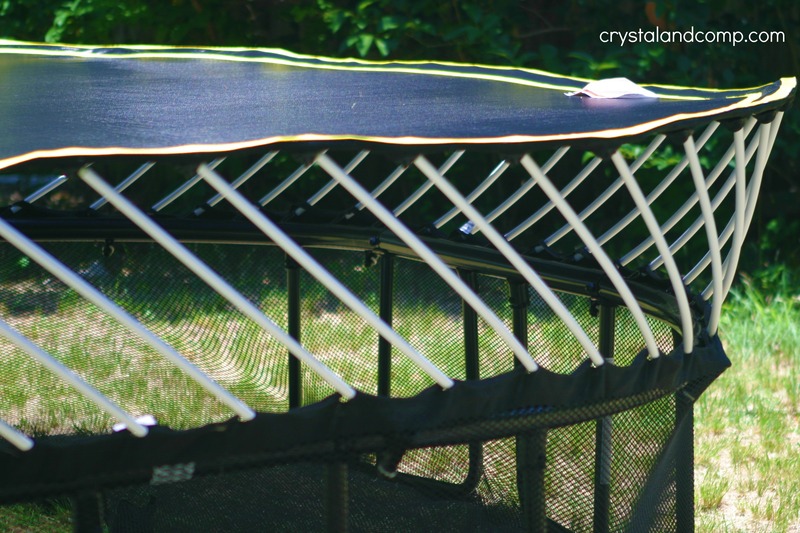 Fifteen years ago a New Zealand dad, who is also an engineer, began researching and studying the traditional trampolines as his children wanted one. And Springfree was born. 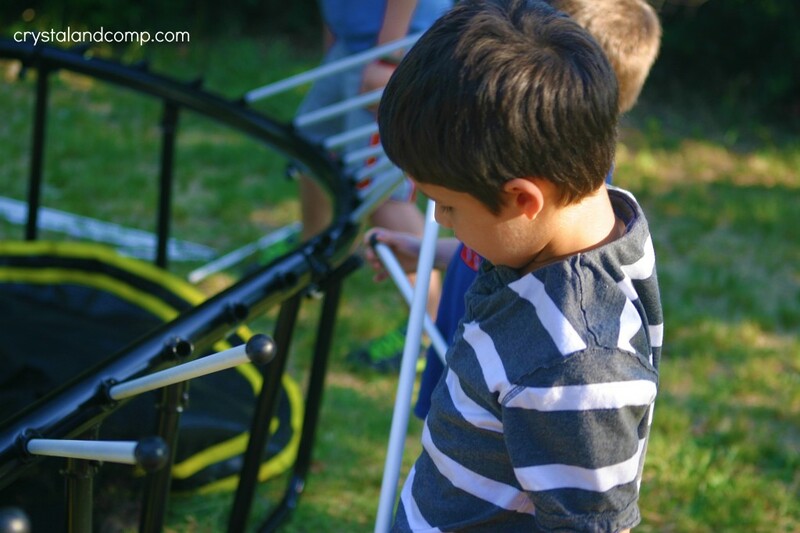 The Dallas Springfree Experience Center sent my family home with a trampoline and I want to share with you the assembly and benefits of this amazing new equipment that my children are in love with. And so is my husband. The assembly was a family project. 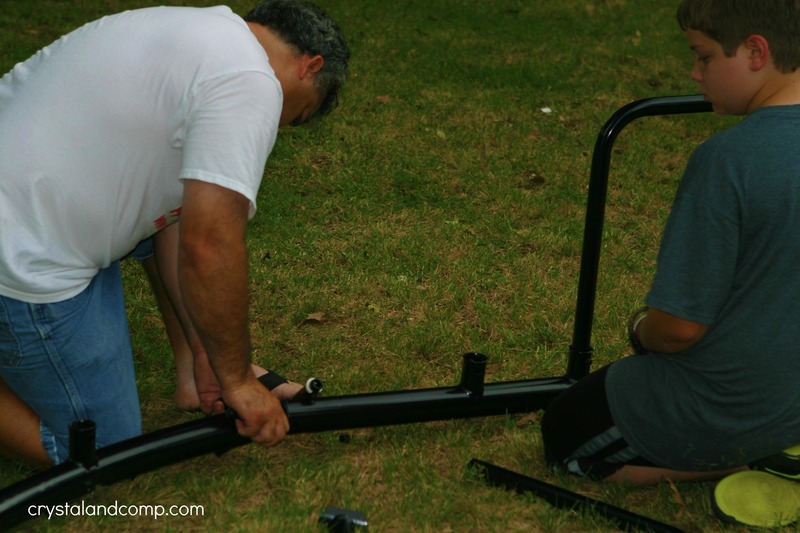 Lenny and our eleven year old began by assembling the frame. Honestly, Anthony did the majority of the frame. He is a very handy soon-to-be-fifth-grader. He takes things apart and reassembles them all the time. Like his dirt bike. He came in and handed me the carburetor once. True story. We placed the mat inside the frame. Like our dead grass? That is what a Texas summer looks like. Then we made an assembly line putting the PVC rods into place. These flexible rods serve as your alternative for springs. This mean no pinching while you’re jumping! At some point the mesh for the safety enclosure was added, but we did this step twice since we did not follow the direction the first time. Then Lenny started connecting the mat to the rods. I am not going to lie- this was not easy. Lenny is the strongest man I know and he struggled as it is a very tight fit. I ended up taking the kids inside because they kept getting close to the trampoline during this step. At one point one of the rods did not connect correctly and it flung back and hit Lenny. Defiantly not a step for the little kids to be involved in. Just be aware and careful during this step. See how the mat and the rods connect to one another? And this is what it looks like after all the rods are connected to the mat. See the black mesh netting draped down below? This is where you pull the netting up and begin to assemble the safety rods. All of the Springfree Trampolines are sold with the safety enclosure. There is no compromising safety.As they say, it is not an option. And this mesh is pretty amazing. It will hold a grown man’s body weight. And this is what the trampoline will look like once completely assembled. Now it is time to jump and have a blast. All of my friends will pretend they do not know me tomorrow. Trampolining provides the vigorous workout necessary to maintain cardiovascular fitness through increased heart and pulse rate, while taking less time out of your busy schedule. Trampolining is a low impact exercise. 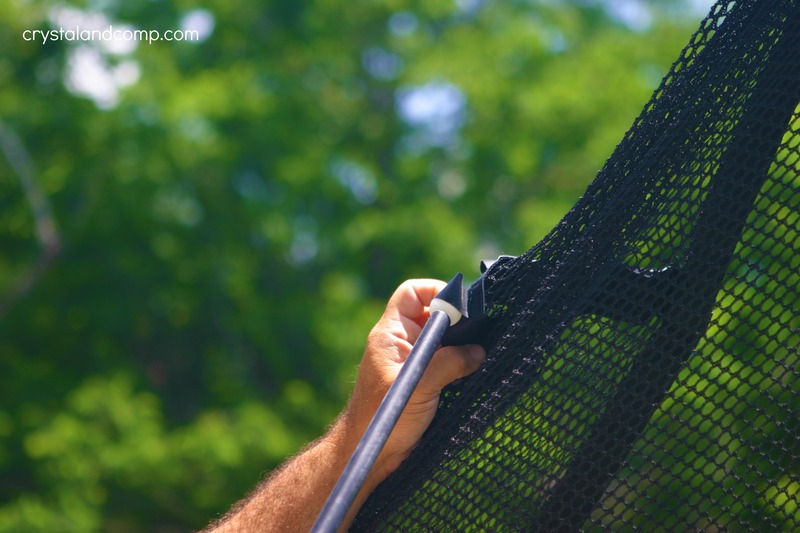 A jumper’s vertical acceleration and deceleration is absorbed by the trampoline mat, taking up 80% of the shock. In comparison, hard surfaces like roads have no \”give\”. 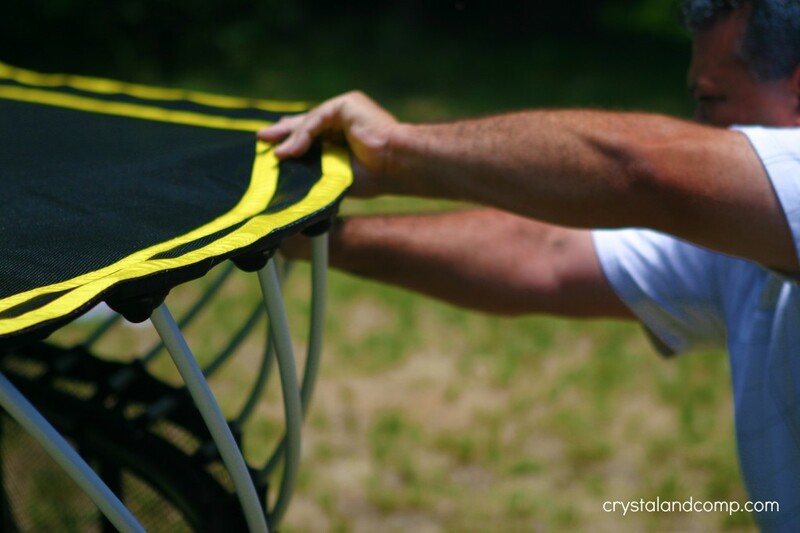 Trampolining protects your joints while exercising your muscles. Bouncing on a trampoline stimulates the free-flowing lymphatic drainage system, helping rid your body of toxins, trapped protein, bacteria, viruses and other cell waste. The acceleration, deceleration and gravity of trampolining provide the ideal conditions for cleansing our body’s cells. Cellular stimulation is increased which forces out waste materials from cells. So the next time your kids tell you they are bored this summer, get them one of these! Health benefits collected from the SpringFree website. My husband took that picture at the end and it cracked me up. Great post. I think trampolines really are a must buy. My boys could stay on the trampoline all day if I would let them, it is wonderful physical activity for them, and I was unaware that they made them spring free. Hope you have a great week!! I liked reading about the benefits, we love our trampoline , too! Belle- I honestly had no idea there were so many benefits until I was introduced to Springfree. Pretty amazing. My kids are having a blast on it every single day. It is great when you can exercise and have fun at the same time. Paula- I was shocked to learn that 10 minutes of jumping is like 30 minutes of running.